Is your vehicle more than three years old? If yes then you need a valid MOT certificate to legally keep it on the road. On MOTonline.co.uk you can book your MOT now or if your MOT is not due at the moment why not register with the site to receive a welcome reminder up to 30 days before your MOT Test is due. Your MOT Test is just one click away with MOTonline.co.uk which means that you are one step closer to that valid MOT Certificate. You need a valid MOT certificate to tax and insure your vehicle. If your vehicle does not have a valid MOT certificate it is not legal, so your insurance is not valid and the police are entitled to stop you to check and to take your vehicle away and charge you a hefty fine, if you don’t have a valid MOT Certificate and insurance. If you have an accident and don’t have valid insurance then you may be personally liable and you risk a spell in prison. More importantly an MOT ensures that your car is roadworthy at the time of the test and has no dangerous faults so helps to keep your family safe and helps you avoid accidents. An MOT certificate lasts just twelve months, and you can have an MOT test completed on your car up to 30 days before your certificate is about to expire without losing any time. To register with MOTonline.co.uk only takes a minute and means you will be sent a reminder by e-mail at least 30 days before your MOT is due, giving you plenty of time to arrange your MOT Test. So go online and register with MOTonline.co.uk today to remove the pressure, even if your MOT is not due for a few months. An MOT Test ensures that your vehicle meets the minimum criteria set by VOSA , and checks that the car is roadworthy and safe at the time of the test. All the garages registered with MOTonline.co.uk are VOSA approved so you can book your MOT with confidence. So take control, stop that MOT reminder sneaking up on you, register with MOTonlineco.uk to receive your reminder e-mail and once you have received it, book your MOT online with the site too. It couldn’t be simpler. If you drive you will be aware that it's a legal requirement to have valid MOT Test Certificate on all passenger vehicles used on the public roads. Failure to have valid certificate could result in a hefty fine and even penalty points on your driver's license which would also lead to increase in your insurance premium. In most cases we are all too busy with our day to day lives that we do not always remember to book the MOT Test or are aware the MOT is due but have not had chance to ring around garages to arrange booking as it's not been convenient. With motonline.co.uk you can book your MOT online for your car, van or motorcycle at your convenience 24 hours a day saving you the time and headache to ring around to get availability. We do all the work for you, simply enter your vehicle details and the best possible date and time that is convenient for you and we will book your MOT with a garage in your area. You simply take the vehicle down for the confirmed date and time and get the MOT test done. With motonline.co.uk you can be rest assured that you will be reminded 1 month prior to the expiry of your current MOT so you will never forget to MOT your vehicle ever gain. Using MOT online provides you with convenience and peace of mind and saves you time and money. We at motonline.co.uk do all the leg work on your behalf. You can arrange to book your MOT online 24 hours a day 7 days a week 365 days a year. We are never closed for you. Our system is very simple to use, so whether you remember at 2a.m. in the morning or whilst you are out doing shopping you can be rest assured motonline.co.uk are here to help you. Simply enter your vehicle details and the best possible date and time convenient to you and we will arrange the booking for you with one of our recommended garages within your area. When do I use MOTonline.co.uk? You can use motonline.co.uk to book your car, motorcycle or van MOT 24 hours day 7 days a week, if your mot is not due just yet, don't worry, you can simply enter your vehicle details and the due date with our MOT reminder system and we will remind you 1 month prior to the expiry of your mot so you will never forget to mot your vehicle. When your MOT is due you can book your vehicle in up to a calendar month prior to the expiry and the extra days will be added to your new MOT. When you make your booking on motonline.co.uk we simply ask you to enter your vehicle details and the best possible date and time and we arrange your booking with recommended garage within your area for you. Class 4 Private Car to Light Goods Vehicles (Design Gross Weight less than or equal to 3000kg) "CAR"
Class 7 Goods Vehicles (Gross Weight DGW over 3000kg up to and including 3500kg) "VAN"
Ok, I want to Book my vehicle MOT, What now? At motonline.co.uk you can book your MOT for your car, van or motorcycle at your convenience 24 hours a day saving you the time and headache to ringing around to get availability. We do all the work for you, simply enter your vehicle details and enter a date and time that is convenient for you and we will book your MOT with a garage of your choice. 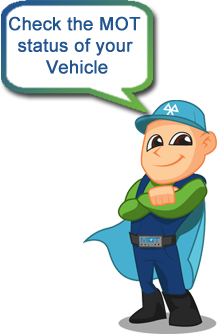 You simply take the vehicle down for the confirmed date and time and have your vehicle MOT test carried out. Not enough? MOTONLINE.co.uk also helps you remember when your next MOT and Service is due so you can be rest assured that you will be reminded 1 month, 1 week and 1 day prior to the expiry of your current MOT helping you avoid forgetting your vehicle MOT. When Do I Pay the MOT fee? The MOT Fee is paid directly to the Garage Testing the Vehicle at the tike of the test. What Type of Tests can I Book with MOTonline.co.uk? How do I use MOTonline.co.uk? SEARCH for a MOT Station by ENTERING your POSTCODE. SELECT the MOT Station by DISTANCE, MOT CLASS or PRICE. ENTER your CONTACT & VEHICLE DETAILS & select your PREFERRED MOT Date & Time. Submit Booking & wait for a CONFIRMATION via EMAIL OR SMS.